TC and others admit they have been pretty good during Speedweeks and very lucky being in the right place at the right time. But there was no question in race five for the Mod Squad, TC was just plain good. It took him a while to get by race leader Kevin Goodale, but once he did, the race was virtually over. Christopher cruised to his fourth win in five nights. Chuck Hossfeld had his DeLange #22 on TC's back bumper crossing the finish line but didn't have enough to get around him for the lead. For TC and car owner Joe Brady, the fourth win was just as sweet as any of the wins they've share together over the years they have run together at Speedweeks. “Joe is great to work with,” said Christopher. “When I told him late last year that I was probably going to run with him, he was happy. “That car is brand new. The other car Joe has is one year old and the motor is good in both cars. My brother might drive the other car one night. And for Brady, who has been fielding cars during the nine nights at Smyrna for over 25 years, having TC in his car now is something he cherishes. Another night... another win for TC. 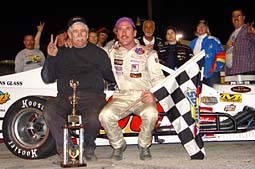 TC celebrates one of his Mod wins this week with car owner Joe Brady (left). he is one heck of a racecar driver. He's very underrated because they say he is a crasher and everything. We run so good with him anytime we get together. I hope we go out there and win the rest of them. 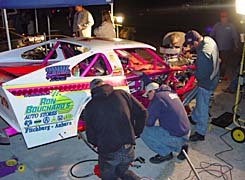 Eddie Flemke started his first race of Speedweeks on Wednesday night. The team experimented with some things in qualifying and turned him a subpar lap. But they got it figured out and looked good in the opening laps of the 50-lap feature. But then coming off of turn number-two Flemke made contact with the wall and his night came to an abrupt end. There was a lot of damage to Flemke's #79. “I was coming off of turn 2 and the car wiggled and it bounced off the fence,” said Flemke who finished fourth. “The right front hub broke then. It bounced off the wall and I wiggled it to make sure everything was all right and check if there were any flats. The car responded well and we went down in the corner. Going in the corner you could see the right front wheel not tracking. It didn't snap but it just slowly moved and the rotor was holding it on and we went straight in the wall. The bad luck continues for Donny Lia and his LMI Team. They switched cars (to the Honda sponsored #18) and the switch didn't bring any more luck his way. Lia was fast, but mid-way into the 50-lapper the car started smoking and then caught on fire. Lia stopped briefly on the frontstretch before bringing the car down pit road for repairs. He finished 16th when the race was over. “You can't write a book like this,” said a disappointed Lia after the race. “Tonight it was a hole in an oil line. We had a little flash fire in the cockpit. It got pretty hot in there. I didn’t know if it was going to stop or not, so I stopped the car. When I stopped the car, it stopped. It was just an oil fire. I didn’t know it at that time though. It seems like night after night Lia has a part-break or some sort of gremlin that prevents him from having a shot at the win. Donny Lia has a little bit of a flash fire on Wednesday night, the result of a broken oil line. “I was so down on Monday, and I still am, but now it's different. Now, this is the ultimate test of ‘how bad do you want it.’ We’ll find out now if we really want to do this. I’m finding out right now if I want to do this, myself, as a driver. “When s--t like this happens night after night and you prepare the best race cars and my team keeps working so hard, it is tough. I have the best guys around. It is hard to keep them pumped up when you have problem after problem. “When you do your stuff and do it right, and still have problem after problem, you find out how bad you want it. That is what brings you out the next night to try and win.”. Kevin Goodale (#58) gets a bump from Jeff Malave (#17), resulting in a big mess. Kevin Goodale had a great race going. The Riverhead Building Supply #58 started on the pole and held on to the lead for quite some time. He even held off the hard-charging Ted Christopher for a few restarts before finally succumbing to TC's effort. But then while running second, Goodale and the #17 of Jeff Malave got together. The two cars spun which ruined both of their chances for a win. Malave chalked the incident up to being just a hard racing. Malave suffered less damage than Goodale in the tangle and went on to finish 12th. Joe Brady's #00 Team came to the track only to realize they had five of their tires slit upon arrival. The track has security and it is a mystery to whom committed the act and how it happened. Donny Lia's Team had their generator stolen as well. Curtis Truex Jr. finished a series high 5th on Wednesday night. Zach Sylvester had pulled the car behind the wall late in the race after a strange night at Smyrna. The #15 was running well but faded at the end of the race and was all over the place before they pulled the car in. After looking at the car they found they had a slow leaking flat tire. Eric Beers has been consistent all week long in the Tour-Type Mods. Now Beers is doing double-duty at Smyrna. Beers hopped in the Zacharias #71, a seat vacated when Tim Arre retired from racing the other night. Beers started his SK Mod ride off with a bang, winning the 15-lapper. Zach Sylvester (#15) slides to avoid the spinning Johnny Denniston. finish of Speedweeks. After banging out some damaged panels the other night, Gaydosh was smooth and stayed out of trouble to get a 6th place finish in the 50 lap race. JR Bertuccio blew an engine in his second race with Bear Motorsports and finished 23rd. North Carolina's Chris Fleming, a SMART Tour runner, ran his first night at Smyrna and was caught up in an early race melee. Fleming finished 14th. 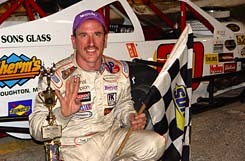 TC's win increased his points lead over Chuck Hossfeld and Eric Beers who finished 3rd. Charlie Pasteryak has rebounded nicely from his opening night crash. The crew worked overnight after the crash to repair the #5. Since the wreck, Charlie has finished 5th, 6th, 7th and 4th on Wednesday night.